Looking for a beautiful WordPress wedding theme? This is a collection of the best wedding WordPress themes. These stylish themes will allow you to build a wedding website quickly, easily and cheaply. You will be able to inform everyone about your upcoming wedding with all the details, share your wedding memories and permanently archive your special wedding day. Many of the premium wedding themes listed below include the elements specifically needed in a wedding website. Some of the features include: RSVP and guestbook functionality, maps for wedding location, bride and groom info page, gift wishlists, featured slideshows, photo galleries to show your wedding pictures and videos, countdown timers, and more. The Wedding WordPress theme from Templatic allows you to create a beautiful and functional wedding website quickly and easily with WordPress. The premium theme has a nice design and all the features you need in a wedding website. All the important information can be displayed on the one page. On the top of your homepage you can display a beautiful banner with your wedding date, followed by information about the bride and groom, venue details, date and time, a relationship timeline, RSVP form, photo gallery, links to your social media profiles, gift registry information and more. Some of the other key features and benefits of the theme include: a mobile friendly responsive design, easy customization options, built with the powerful Bootstrap and Underscores S framework, 1 click auto install, demo data, third party plugin support (WooCommerce, Gravity Forms, Profile Builder, WPML etc), blog, photo gallery and more. Quinn is a beautiful and stylish WordPress theme from Bluchic that could be used for a wide range of purposes either as a website or a blog. 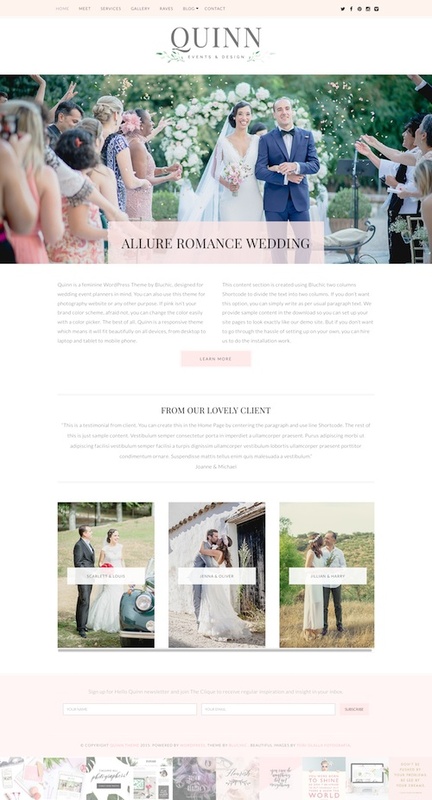 The premium theme would be perfect for wedding and event planners, photographers, small business websites, or any other type of website needing a lovely feminine design. Some of the key features of the theme include: a mobile friendly responsive design, full width auto scrolling slider, sticky menu on top, customizable color schemes, 3 promo boxes for pages or call to actions on the homepage, newsletter subscription form, infinite scroll or basic pagination, social media icons, gallery template, translation ready, one-click auto theme update and more. Wedding Engine is an elegant wedding WordPress theme with all features and functionality you need in a wedding website. The premium theme from Engine Themes allows you to easily create a beautiful custom website for your wedding. It offers front-end customization options and a flexible content editor so you can easily create the layout, style and color scheme to match your wedding. Some of the key features of the theme include: the ability to share photos and videos, countdown timer, wedding events pages, RSVP form, ability for guests to leave messages and best wishes, blog section, various pre-made color schemes, header and footer initials for the bride and groom, automated email notifications, slider, statistics information about guests, localization ready, a mobile friendly responsive design and more. Together is a unique wedding WordPress theme from 7Theme. The premium theme has an elegant and beautiful hand crafted designed perfect for wedding invitations, wedding announcements, wedding blogs and websites to showcase your special day. Some of the key features of the Together theme include: a mobile friendly responsive design, 6 different photo gallery options, countdown timer, upcoming dates, Bride and Groom pages, animated menu, unlimited color and background options, parallax effects, WooCommerce ready, drag and drop slider management, and lots of other customization options. Big Day is a wedding WordPress theme designed for wedding planners, wedding photographers and others businesses in the wedding industry. The premium theme from 7Theme has a modern and fully customizable design that allows you to easily showcase your products and services in a design that suits your brand. Some of the key features include: portfolio pages, testimonials, team page, slideshow, lots of customization options (colours, background, fonts, etc), drag and drop social icons, unlimited sidebars, logo upload, contact form, 100% mobile responsive and retina ready, custom widgets and more. Neeqah is a classy wedding WordPress theme with a mobile friendly responsive design. The theme has a full widgetized drag and drop homepage so you can easily display what you want, how you want. You can add a featured slider, info about the bride and groom, a countdown timer, photo gallery, information about the wedding location and program, map, RSVP form and tweets form the couple. Some of the other features include: powerful theme options, advanced typography controls, unlimited colors, custom page templates, filterable gallery, accommodation, guestbook, and more. 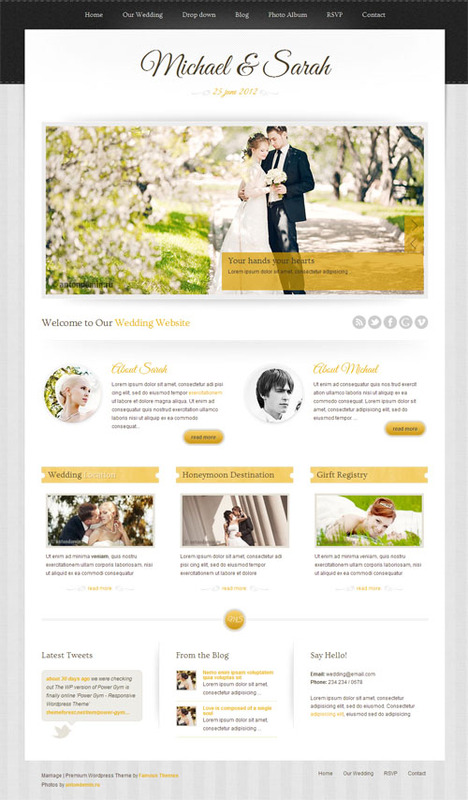 My Wedding is a premium wedding WordPress theme with a mobile friendly responsive design from Nimbus Themes. It has a simple but elegant design that allows you to easily create a wedding website and share all the important information and details for your special day. 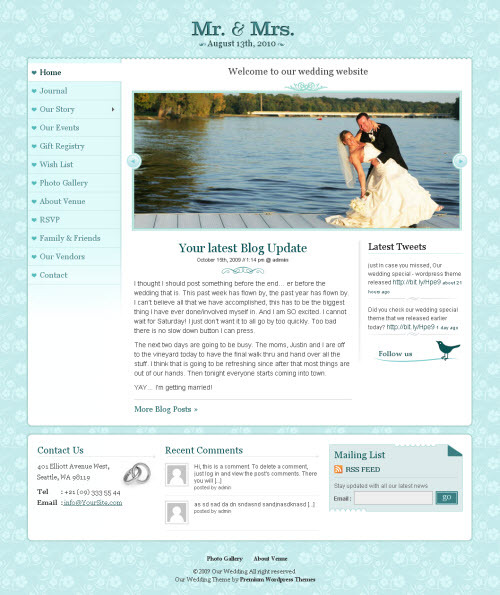 Some of the notable features include: a row based homepage layout to feature content, full screen header image and announcement banner, RSVP form, about us section for the bride and groom, custom photo gallery, blog section, unlimited color options, customisation options (fonts, sizes, layouts, sidebars etc), shortcodes (for button, columns etc. ), Google fonts, social media options and more. 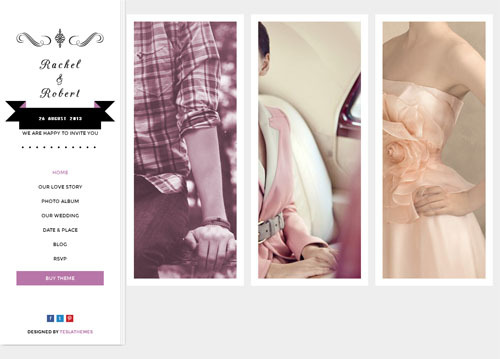 Just Married is a simple but beautiful wedding WordPress theme from ThemeFuse. The premium template allows you to share your wedding plans with family and friends, and archive your special day forever on the web. The theme includes all the features you need in a wedding website including online reservation functionality, online registry, details for the location, accommodation and more. It has numerous style options including 14 different backgrounds, patterns and colours. Just Married also has a responsive design so will scale to work perfectly on all devices from desktops, tablets to smartphones. The Wedding Day WordPress theme is a lovely, mobile friendly wedding theme. The premium theme has a beautiful design and is mobile ready with a responsive design. It has easy styling options and a drag and drop builder so you can create the layouts you want with endless layout possibilities. Some of other features include: powerful theme options, 10+ portfolio layouts, slider, translation ready, boxed or full width layouts, bonus print wedding invitation template, and more. Wedding Day is a really unique and stylish WordPress wedding theme from Tesla Themes. The premium theme has a everything you need in a wedding website including a beautiful photo album, dedicated pages for your wedding ceremony, date & place, RSVP form and a stylish blog. Wedding Day has a full width mobile responsive design so will work great on all devices from desktops to mobile phones. Some of the other notable features include: smooth transition effects and sliders, social media integration, filterable photo album, customizable countdown, AJAX forms, Google Maps, powerful admin options panel and more. Marriage is a wedding WordPress theme with a responsive layout. The responsive design makes it work on all devices from large monitors right down to small smartphone screens. The theme has a nice minimal design with beautiful simple colours and web fonts to match your wedding. It comes with 8 premade colour schemes, but the custom admin options panel allows you to easily change the main settings, change colours, modify the layout and more. The custom homepage has a slider, sections for the bride and groom, and sections for other relevant wedding information. 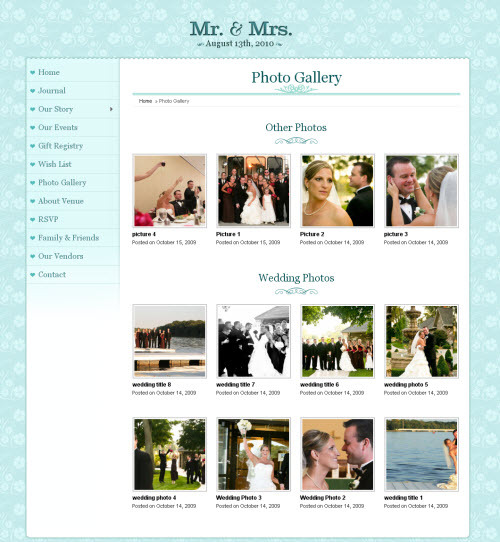 It also has a photo album section to show off your wedding photos and videos. Enlance is a one page WordPress theme for wedding, engagement or other event websites. The commercial theme from Minimal Themes has a simple and pretty mobile friendly design with elegant parallax effects. 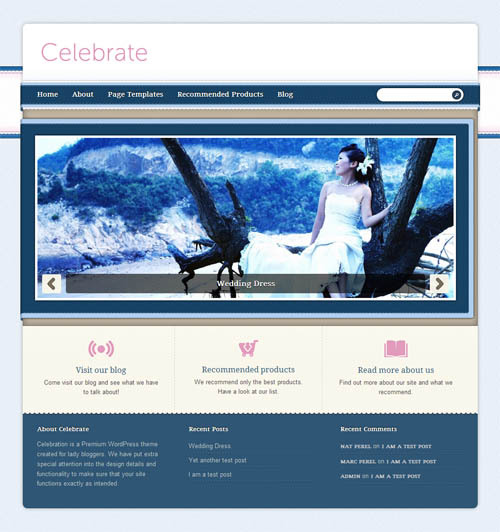 The theme ideal for setting up a nice website to inform everyone about your engagement and upcoming wedding. The single page design allows you to present all the important information right on the homepage. The homepage builder lets you build it the way you want and you can display a featured image slider for photos, wedding date and countdown timer, RSVP form section and live RSVP lists, and sections for information about the bride and groom, wedding event page for ceremony details and location, gift registry, and more. Some of the other features include: option for a custom logo, built-in contact form, shortcodes, theme options, social networking links, and more. Wedding Vow is a mobile responsive, single page wedding WordPress theme. The premium theme has unique design that’s great to show your family and friends the best day of your life. This theme has a 12-column grid based on Twitter Bootstrap framework and uses the latest HTML5, CSS3 and WordPress technologies. A wedding WordPress theme from Templatic designed specifically to easily build an elegant personal wedding website with WordPress. The theme includes lots of custom widgets and admin options to easily set up the theme, photo gallery, 4 colour scheme options and more. Wedding is a powerful single page wedding WordPress theme. It’s flexible and easy to customise and has a mobile responsive design. Features include unlimited colour schemes, timeline feature, gallery with multiple albums, post formats, slide show, theme options panel and more. A a multi-purpose premium WordPress theme from Obox Themes that could be used for wedding sites, baby sites, blogging, affiliate sites or business websites. The theme includes two homepage layouts, recommended products page using custom post types, custom logo and background input, multiple page templates and more. Merit is a wedding WordPress theme with a mobile responsive design and nice parallax background effects. The premium theme is powerful and customizable with a drag and drop homepage builder, unlimited colour options, lots of typography choices and a comprehensive options panel. It also comes with an AJAX RSVP form, testimonials, filterable photo gallery, history, events, countdown timer, slideshow and more. Soul is an attractive wedding WordPress theme with a clean and elegant design. The theme is mobile ready with a responsive layout, custom post types (gallery, events, guestbook, sliders), 10 page templates, unlimited colours, theme options panel, shortcodes and more. Geek Love is a beautiful, clean, minimal and mobile responsive WordPress theme for weddings. It has a number of features specifically for a wedding website. Events pages allow you to set up your wedding events easily and give directions to your visitors describing each event in a dedicated event page. An RSVP form allows guests to RSVP to the wedding from the homepage and a guestbook lets visitors record their messages to the bride and groom. You can also have a photo gallery. Other features include: a fully widgetzied homepage, colour picker, custom Google fonts, full localisation, theme options panel and more. While the theme name is probably not the most suitable for a wedding, Game Over is an elegant and romantic wedding WordPress theme. 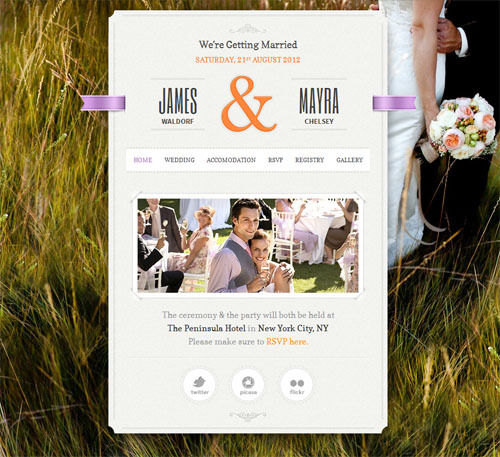 The theme can be used for engagement or wedding websites or an online invitation card. It has a drag and drop homepage builder, a time line page view where you can share your love story and precious moments, a wedding event program, guestbook, and photo album. Other features include: social media buttons, a mobile responsive layout, powerful options panel, multiple log layouts, custom background colours / images and more. Vintage Wedding is a wedding theme with a traditional design and vintage colour scheme. The theme has a responsive design, RSVP and wedding invitation email options, bride and groom photo section, AJAX photo gallery, 12 widget areas, 11 page templates, slider, admin options panel and more. 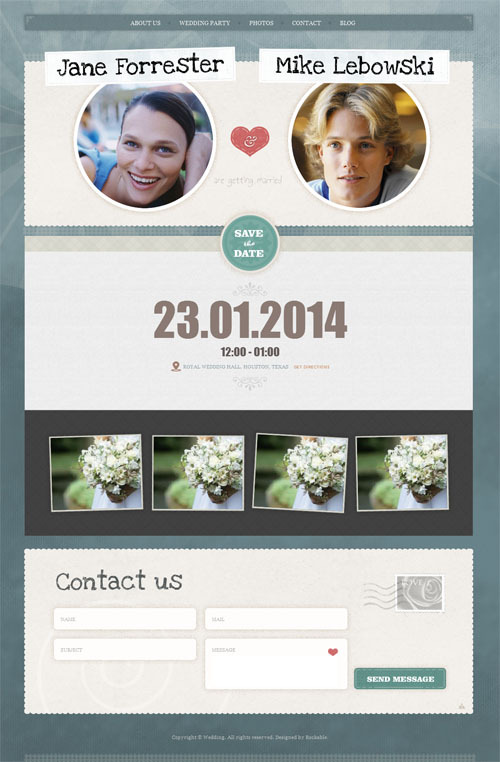 Wedding Invite is an easy to customise one page wedding invitation website WordPress theme. It has a modern and playful design ideal for young couples of the internet age looking for something different than standard online invitation cards. It has a fancy slider, photo gallery, location map, blog section, contact form and more. 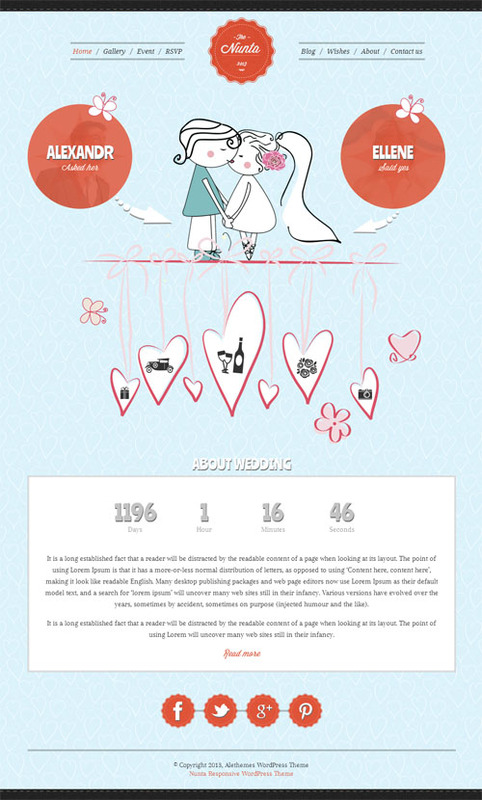 Nunta Wedding is a cute, fun and creative wedding WordPress theme. Features include: 10 different colour options, custom backgrounds, unlimited fonts, photo gallery, blog section, contact page, theme options panel and more. The theme is also mobile ready with a responsive design that works on all mobile devices. 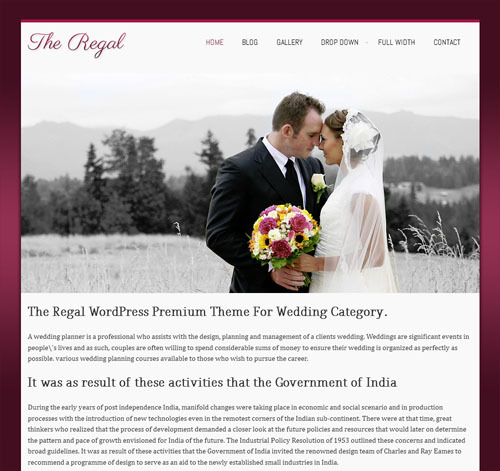 A premium WordPress wedding theme from Theme Warrior. 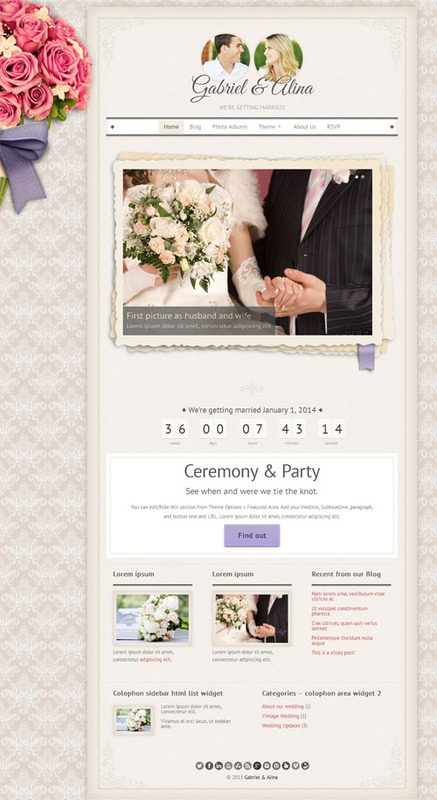 The themes allows you to create a website to share your wedding memories and permanently archive your special day. Features include a countdown and count up timer to count how long you have been married, gallery section with gallery post types and custom taxonomy, featured slideshow, 5 colour schemes, theme options panel and more. Wedding Slide is a purpose built WordPress theme for a wedding invitation website. The theme allows you to outline all your wedding details and has pages for your wedding location, info about the bride and groom, gifts register, contact / RSVP page, display photos and more. The theme is mobile and retina ready with a responsive design, 20 colour options, 15 background options, shortcodes, 50 card patterns and more. Qaween, derived from the Indonesian word “Kawin” which means married or getting married, is an attractive and feature packed wedding WordPress theme. The premium theme has a mobile responsive design and is highly customizable with a fully widgetized drag and drop homepage, unlimited color options for almost every element, and advanced typography controls with over 500 Google font options. The theme also comes with lots of features you need in a wedding website such as: AJAX RSVP form, photo gallery, events, countdown timer, slideshow and more.